The Indians won their 22nd game in a row Thursday night. The Indians won their 22nd game in a row Thursday night. The Indians won their 22nd game in a row Thursday night. Just insane. The only team left ahead of the 2017 Indians is the 1916 New York Giants. Their streak of 26 straight wins includes ties, however, so I think Cleveland has a strong case for the best baseball winning streak ever. They were 69-56. And now they are 91-56. I just can't get over that. But, tonight wasn't so much about the length of the streak. It was about how the Indians won. Down 2-1 in the bottom of the 9th to a Royals team that is playing for its season, Francisco Lindor came through. With two outs and two strikes, he hit a double just out of Alex Gordon's reach to tie the game. 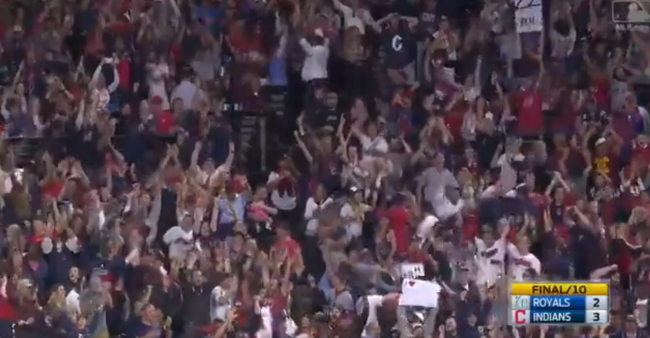 And then in the bottom of the 10th, Jay Bruce walked it off. What a game. What a streak. God bless, baseball.